In 1950 S.J. (Statens Järnvägar - Swedish State Railways) handled 70% of the passenger transport market in Sweden. However, by 1995 this had fallen to 16% with car travel accounting for 68% of traffic and the remainder by bus and air. In the 1960's talk started on how to win back business. At that time the maximum passenger tram speed in Sweden was 130Km/h (80mph). In 1967 it was decided that speeds needed to increased to 200Km/h (125mph), but with the mainlines laid with 50 Kg/m rail and a minimum radius curve of 1000m the maximum permitted speed in comfort was only 140Km/h (87mph). Capital investment was not available to improve the infrastructure. By 1970 it was realised that a tilting train would allow an increase in line speeds without substantial new investment in infrastructure. In 1974 a 4M joint venture between S.J. and ASEA was commenced to develop a prototype tilting test train. The prototype test train was developed from a 3 car 1947 built Class X1 EMU and was designated Class X15. The tilting test train was delivered in 1975 and achieved a maximum speed of 237.8Km/h (148mph) between Stockholm and Gteborg during trials in the first year. The prototype train utilised air-tilting technology and tested three different bogie types, including self-steering versions. 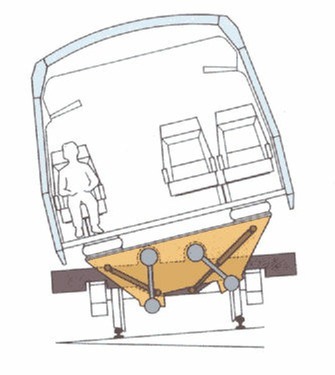 A large amount of space, equivalent to half a coach, was required for the tilt mechanism. In 1981 S.J. was given permission by the Swedish government to acquire three prototype high speed tilting trains. However, in 1983 all received tenders were rejected and a revised specification issued. In 1986 following a further round of rejected tenders, S.J. ordered 20 trains of X2 type on 27th August 1986 from ASEA, due for delivery in December 1989. This was the largest ever investment in new stock by S.J. In 1987 a prototype coach, built by Kalmar Verkstad AB, was delivered and incorporated in the X15 test train. This coach was tested over three winters in temperatures down to -30C and in summer up to 35C. Much useful information was gained from these tests and incorporated into the production units. X2, number 2001, was delivered by ABB (as ASEA had become), in December 1989 and on 17th December 1989 achieved a journey time of 2hrs 54 min between Stockholm and Gteborg. However due to problems "With almost everything", this first train was not accepted by S.J. until seven months later. In 1990, S.J. decided to name the train X2000 – “The train for the year 2000" . Passenger services commenced on 4th September 1990 between Stockholm and Gteborg with a running time of 3 hrs 35min. At this stage approximately half the route, some 230Km (140 miles), was available for 200 Km/h, the remainder of the route was awaiting resignalling. The original twenty X2 trains consisted of a power car and five passenger coaches, one of which is a driving trailer. Traction voltage - 16,000V @ 16.7Hz overhead. Coach transformer, converts 1000V to 220V, 65V & 26V. 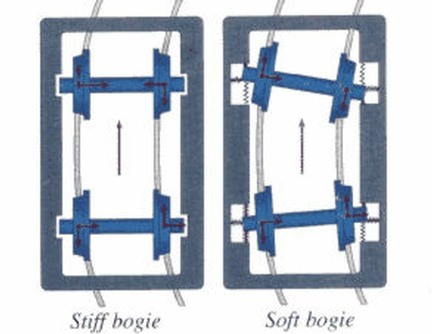 Radically-steered bogies on their own allow an increase in operating speeds by 40% or up to 180 Km/h (112 mph) without increasing rail/wheel forces compared with conventional bogies. This reduces wear on both the rail and wheels - wheel life is increased by up to six times. However, the increase in speeds allowed by these bogies would be uncomfortable to the passengers without tilt. Tilt is used primarily for comfort. A sensor, an accelerometer, is fitted in the first bogie of the train in the direction of travel and measures, like a pendulum, lateral forces as the train enters a curve. The signal from the accelerometer is processed by computer and sent down the train. Computer-controlled hydraulic ram tilt each coach into the curve, up to a maximum inclination of 6.5. The tilting system compensates for up to 75% of the lateral force of a curve and is only employed at speeds above 70 Km/h (44 mph). Incidents of 'seasickness' or 'tilt nausea’ are very rare as 25% of lateral forces are still felt by the passengers. With the driving trailer leading, the rate of tilt is slightly higher in this coach, as there is no prior warning of the train entering a curve, as them would be with the power car leading. The rate of tilt for the intermediate trailers is 1m/s and 1.5m/s for a leading driving trailer, there is no tilt fitted on the power car. Each power car is equipped with four axle-mounted asynchronous three phase traction motors divided into two group and driving through a quill drive. The voltage and frequency supplied, to the motors is varied to set the speed. Each unit is equipped with three braking systems which are rheostatic, electro-pneumatic disk and emergency magnetic track brakes. ATC is employed which takes over from the driver in an emergency. In 1995 the service from 05.00hrs to 23.30hrs had to be operated at 96% availability, this compares with 82% to 83% availability for the RC classes of electric locomotive. When ordered S.J. specified 12 failures per 1.2M Km (745,340 miles). In the period from 4th September 1990 to 5th September 1995 the X2000 units averaged 3.32 failures per 1.2M Km. S.J. are currently holding discussions with ADtranz (as ABB has become ) to increase the reliability further so as to obtain one more departure per week. After 25,000 departures there had only been 20 tilt failures. Maintenance is controlled by a computer-controlled 'split' system with principle maintenance undertaken at night but maintenance also scheduled to be undertaken during turnaround time at terminals. Faults occurring in-service can be radioed ahead for attention on train arrival. 95% of Swedes recognise the name "X2000" as being a S.J. train. X2000 is advertised with the slogan –“X2000 – Easier than flying. Faster than the train” . The on-train accommodation is sold as "Budget Class", equivalent to 2nd class and "X2000 Class" for business customers. An at-seat meal and complimentary newspaper is included in the X2000 class ticket as well as access to fax, phone and photocopying facilities. Plenty of space is available for working, including with a lap-top computer. For budget class ticket holders a trolley and Bistro Car are available. A three-channel sound system is available in both classes from seat mounted headphone jacks. On-board crew have been sourced from S.J's own staff and are specially trained. Since introduction between Stockholm and Göteborg, 60% of market share has been taken from air and 98% of passengers who try X2000 have come back again. These figures am exceptionally high - the airline, SAS, managed far less and even contacted S.J. to find out how it was done! Before introduction of X2000 between Stockholm and Gteborg S.J. InterCity had 19% market share. By the autumn of 1995 rail market share had increased to 71% - 52% by X2000 the remainder by InterCity. It has been found that the market requires more departures, rather than increased train length. More units at maximum availability are required to meet this demand. Demand is still growing but S.J. cannot afford the capital investment for more units. The public demand more train services and for the X2000 service to be expanded to other routes. Göteborg, Stockholm extended to Arlanda Airport. The X2000 name is registered in Sweden, Norway, Germany, USA, Canada and China. In 1991 a X2000 wit ran trials in Germany for the UIC. Unit 2013 was exported to the USA in 1995 and was extensively used in service on Amtrak's North East Corridor. These trials were carried out in competition with the German ICE and French TGV units. The X2000 demonstrated considerably superior ride qualities and lower track forces with the Amtrak Metroliner, German ICE and French TGV units. Unfortunately the X2000 was not selected as insufficient quantities of the train could be built in USA to meet the "buy American" policy so a version of the TGV, known as "Acela", with some North American construction was eventually purchased. A plague in the Bistro Car of unit 2013 commemorates the visit to the States. In 1997 S.J. propose to increase train speeds to 220Km/h (137mph) and by the yew 2000 it is hoped to run at 250Km/h (155mph) on principle routes This will reduce the journey time from Stockholm to Göteborg down to 2 hours 30 minutes and Stockholm to Malmö down to 3 how 30 minutes. 250Km/h is expected to be the maximum speed ceiling in Sweden. Discussions have taken place regarding the possibility of running X2000 formed of two power cars and ten to twelve trailers. It is already possible to run up to three X2000 in multiple.